Zen of business: a CEO or a monk? Shi Yongxin says he intends to promote Shaolin culture through commercialization. But is that so? Does Shi’s bold moves make Shaolin more secular than a Buddhist shrine? herringbone: Why can't he be both? I'm no expert on buddhism, but if what he's doing is spreading acceptance of the religion isn't that holy in and of itself? janeyq: I do not think the activities of Shi's are unacceptable. What is the tradition?if the new enovations do good to the development of the community,why not pave ways for them. Maybe the new things will became the "tradition" several hundred years later. Just think about the enforcement of Market-oriented policy in China nearly two decades ago,which was regarded as a violation of Socialism .Then ,when we try to accept the new strategy, did it look so disgusted as it should be? what I really care is that : whether he do helps the buddhism survive the morden society! 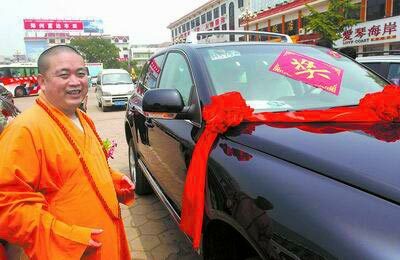 When Shi Yongxin, the 30th head abbot of Shaolin Temple, was presented with a spectacular sports sedan valued at one million yuan (US$125, 000) for his contributions to the local tourism industry, it raised increasing doubts that Shi is more a businessman than a monk. "I resorted to commercialization to promote Shaolin culture," Shi asserted. One of his great successes is the Shaolin Martial Arts Performing Group. The group has performed in over 60 countries and regions, making an international reputation for Shaolin Kungfu. Shi spends time every year going abroad to meet celebrities from various communities. And he is among the first to send his monks to take MBA courses and get degrees. He uses TV, films and the Web to promote Shaolin Temple. In 2003, the China Internet News Media Forum was held in the main hall of the temple. Shi is also directing a multi-million-dollar movie expected to be finished in time for the 2008 Beijing Olympics.